One of the most common complaints of aging is the appearance of age spots, also known as liver spots, sunspots or lentigines. They're annoying dark spots that tend to form on your face, arms and hands. The sole cause of these brown spots is sun exposure. Most people don't have to worry about them until they're nearing the age of forty. If you're young, you should begin preventive measures to prevent them from appearing later on. Age spots aren't dangerous but they can be unsightly. If they're already becoming visible, there are a few things you can do to diminish them, though there is no quick cure. The most important thing you can do is to protect your skin from the sun's harmful UV rays. Reduce exposure when possible and wear a sunscreen that has a SPF of at least 15. Wear hats when outside and cover up with clothing when it's practical to do so. Remember, though reduced, the sun's rays also penetrate your skin when it's cloudy. Looking for a natural solution? Due to the fact that lemon juice has a high acid level, it's no surprise that it will help peel off layers of skin. This will either lighten or remove age spots completely if you rub it on your skin twice daily. It will probably take several weeks to see improvement, so you'll need to be dedicated and patient. Don't have lemons? Try red onions, they're known to produce the same results. Exfoliation removes dark surface cells to fade existing discolored pigmentation. Benefits include increased skin cell renewal which promotes softer skin, fades age spots, and helps even out skin tone. This technique can be done at home or by an esthetician. 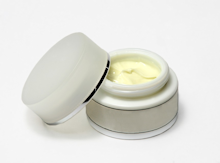 Available in most drug stores, fade creams are over-the-counter (and stronger, prescription) creams that contain bleaching agents to lighten spots. The best results are on those with naturally fair skin. If your skin is medium to dark, fade creams containing Hydroquinone can make your spots even darker. The safety of this Hydroquinone is questionable, therefore, not advised. This is a process in which acids and lasers work to remove deep layers of skin in an attempt to remove the age spots. You can find chemical peels for home use or go to a professional for a series of laser treatments. The main ingredients in retinoids is vitamin A. Their job is to trigger growth of new cells, fading unwanted spots in the process. On the downside, retinoids can be too harsh for your skin, causing it to become dry and flaky. Cosmetics, a girl's best friend. While you're waiting for your brown spots to fade, hide them with foundation or concealer. Need a more heavy-duty formula? There is special makeup available specifically for hiding spots or covering scars. If you don't want to spend the extra money, you can try regular, heavy-based products.